Karl Georg Zschaetzsch (1870- ?) was a German who, in 1920, placed Atlantis in the Atlantic and identified its people with the Aryans. He considered the Atlanteans to have had blonde hair and blue eyes, which sounds sadly familiar. His views were adopted by the Nazi Ahnenerbe. Zschaetzsch also supported the idea of a cometary impact being involved in the destruction of Atlantis. Zschaetzsch suggested that Atlantis was situated in the Azores and published a map illustrating t his. 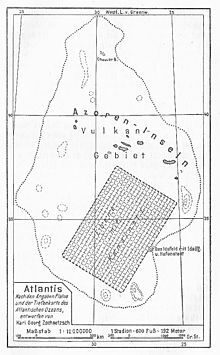 For those who can read German and are interested in the madness of that period, Zschaetzsch’s book Atlantis – die Urheimat der Arier (Atlantis: The Original Home of the Aryans) can be downloaded from the Internet(a) for €5. As a bonus Zschaetzsch eventually reveals that he is descended from Jupiter and that his unpronounceable name is really just a corruption of Zeus!